Summer Social Outings (10-14 yrs) Wednesdays and Saturdays (5:00-7:00pm) July-August. The ASCEND program is pleased to offer summer events for boys and girls with autism. It’s a ton of fun bundled into a positive, caring & safe environment that provides the opportunity to develop friendships and connect with other peers while participating in fun recreational and social activities. 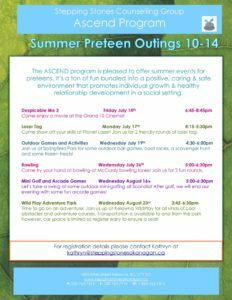 Outings include but are not limited to Wild Play adventure park, Kelowna Escape Room, going to the movies, Wii days, and various outdoor activities. Please contact Kathryn at kathryn@steppingstonesokanagan.ca for registration details.